Displays GPS and sensor data: position and signal strength of satellites, accuracy, speed, acceleration, altitude, bearing, pitch, roll and battery state. Its tools include compass with magnetic and true north, levelling tool, marking or sharing location and navigating back later using the Radar. 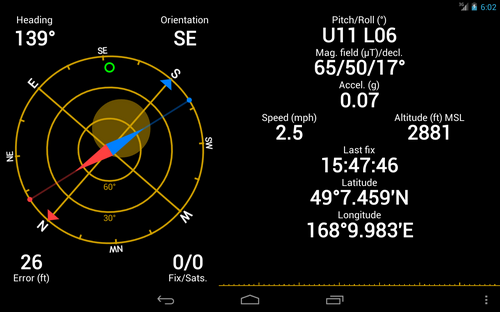 It cooperates with Locus Map on displaying maps and guiding to POIs.